“Grace Cod-dington”, the flame-haired Vogue creative director, has her head stuck on a fillet of fish. 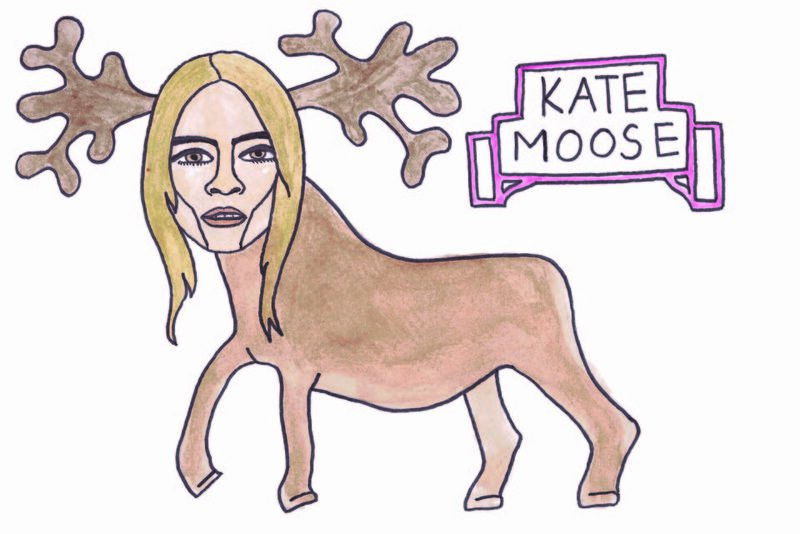 “Kate Moose” offsets her cheekbones with antlers. “Puffin Daddy” has sunglasses and bling poking out of his plumage. Not the result of a cloning experiment gone very wrong, or the fevered Frankenstein-ish dreams of a fashion editor, but just a few of Angelica Hicks’ latest creations. Hicks takes on music, art and politics, too — the fallout from the US election-inspired “Trumpelstiltskin” and “Not My Pez” featuring Donald’s head on a sweets dispenser. Brands and logos regularly pop up — the Warholian Naomi Campbell on an appropriately named can of soup, Spam-ela Anderson or “Mac-Donalds” with eyeliners as fries — and she recently collaborated with the likes of Spanx, Range Rover and the dating app Bumble. Hicks says she grew up doodling, but one suspects in her household it went a bit further than finger paintings pinned to the fridge. Her mother is the interior and fashion designer Allegra Hicks and her father is architect Ashley Hicks. “They weren’t the kind of parents who were down to kick a ball on the beach, so sitting around the table drawing was our family bonding activity,” she says. But GCSE art sucked the joy out of the subject for her. “At my school it was very much like ‘replicate this pre-existing artwork and get an A*’ which I found frustrating,” says Hicks. “I pretty much stopped drawing when I was about 15.” After studying art history at University College London — “not going to art school was my hilarious form of rebellion- I wanted to study economics or something” — she discovered the Dada artist Hannah HÃ¶ch’s photomontages, and was inspired to start making her own work again. Hicks moved to New York after graduating — “if I’d stayed at home I wouldn’t have the same drive” — and now lives in the West Village, where she spends her days eavesdropping on shoppers for inspiration and uploading one drawing a day to her 31,000 followers on Instagram. Although her family connections obviously come with serious perks — when Hicks first moved to New York she was living with a family friend on the Upper East Side (ahem) — she says the weight of expectation can feel intimidating at times. I love it when someone tags a friend in one of my Instagram pictures. I don’t want to say I’m generating discourse, but hopefully I’m generating jokes.